Word’s out that Apple’s latest Mac Pro costs less than an equal-configured do-it-yourself PC, but as we’ve discovered, this is one of those cases where there’s more than meets the eye. Has Apple finally loosened up on its famed “Apple Tax”? Not so. Instead, the attractive pricing of the latest Mac Pro owes its thanks to none other than AMD. The “Can I build a PC for less than the price of a Mac?” question is about as old as Apple itself, and it pops-up every single time the Cupertino firm releases a new desktop model. Not to break tradition, the question again came to the surface after last week’s launch of the updated Mac Pro; this time, the answer to that aged question was a bit different. Futurelooks‘ Stephen Fung, who happens to be a wizard PC builder (he beat me twice over at Tiger Direct’s annual charity event at CES), took to Apple’s website and others to see if a do-it-yourself PC build would be possible for less money than an equal-spec’d Mac Pro. What he found was interesting: Not only was there no visible “Apple Tax”, the Mac Pro turned out to be cheaper. About $2,000 cheaper, in fact. I didn’t catch the article right as it was published, but was instead tipped-off by our Mac-lovin’ Senior Editor Brett Thomas. Brett and I have had some fun Mac vs. PC debates in the past, so this was one of those times I had to investigate further. After reading through Stephen’s well-thought-out article, something didn’t seem right. I took to Apple’s configurator which confused things further. The 12-core CPU involved in this build can be had for about $2,700 on Newegg, while Apple charges $3,500 for it as an upgrade. 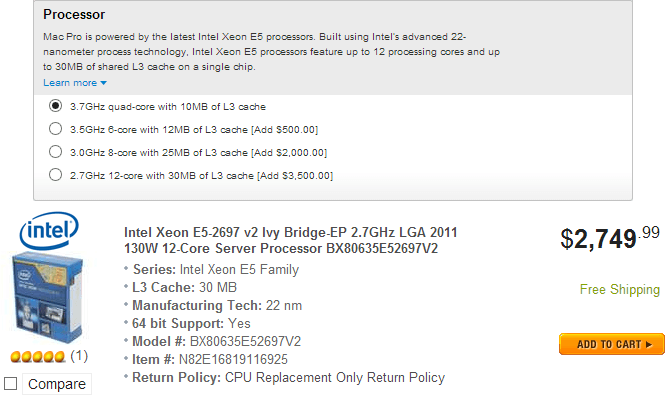 If this is the pricing scheme, how on earth did the Mac Pro end up costing less? As it turns out, it’s because AMD has given Apple one hell of a deal on GPUs, and ignoring all of the other components, this one would result in the PC costing about $2,500 less, not $2,000 more. The minimum-spec’d Mac Pro costs $2999.00, and when starting from that baseline, upgrading both pre-configured GPUs to the top-end offering costs $1,000, as seen in the shot below. 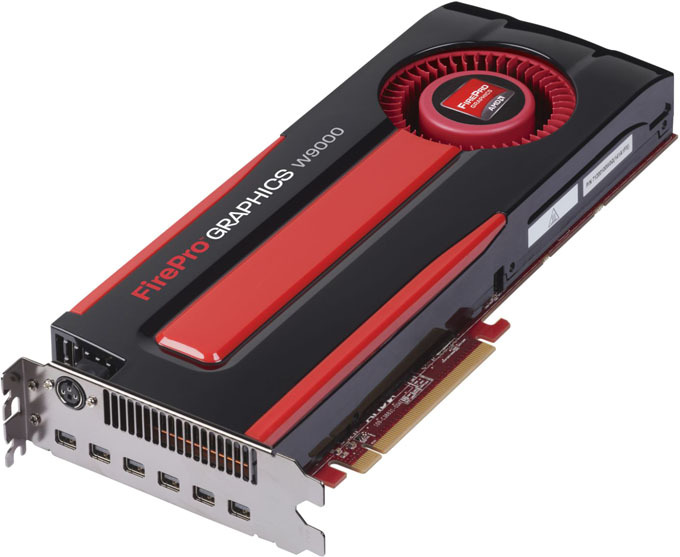 AMD’s FirePro DX00 series is unique to the Mac Pro; it’s based on the company’s pre-existing current-gen workstation cards. The model differences, then, are likely due to super-small changes that had to be made to adhere to Apple’s requirements. The D700, for example, offers 87.5% of the total performance throughput (single precision) of the W9000. Based on the fact that an upgrade from dual D300s to D700s costs $1,000, and also that these upgrade prices tend to be a bit higher than retail costs, I’ll go out on a limb and say that Apple’s charging a flat $750 for each GPU. That implies that when a baseline Mac Pro is upgraded, ~38% of its total cost owes its thanks to the GPUs. So – AMD is allowing its $3,200 workstation card be sold on Apple’s latest Mac Pro for about $750. That is the number one reason the PC loses out in this particular battle. Let’s not overlook something even more important: Why is AMD allowing its top-end part to be sold on the cheap with Apple? If a PC user were to purchase the W9000 tomorrow, it’d cost them about 4x as much as someone who purchases a pre-built Mac Pro with D700. Why… why… why? I’d guess that it’s because NVIDIA owns about 80% of the workstation GPU market (a figure I’ve had a hard time nailing-down but one that NVIDIA gave me a couple of weeks ago). It seems, then, that AMD had to bend a lot in order to make sure Apple didn’t take the green route this time around. It’s not as though AMD loses revenue because of this steep discount – if Mac Pro volume is good, its super-low pricing could yield more revenue than the equivalent cards on the PC side selling for 4x as much. Overall, it’s a smart move, and a great one for those purchasing a Mac Pro. 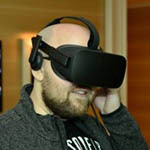 I’m not going to compile a part list that attempts to build a PC to match or almost match a Mac Pro, because the fact of the matter is, the Mac Pro is very unique and offers a couple of features that aren’t even possible on the PC at the moment (such as Thunderbolt 2 on a workstation motherboard). In effect, and pardon the pun, an “apples-to-apples” comparison is impossible. About the originating pricing comparison, though, it’s become clear that if AMD began offering its W9000 workstation cards to PC users for the same price that Mac users are paying for the equivalent D700 models, then the PC would end up costing much less in this particular comparison. But, I need to be clear: None of this is to imply that the Mac Pro is instead the “expensive” platform. Again, Apple’s latest is unique… far more unique than I’ve ever seen a PC be. Its design was built from the ground up to be super-efficient – so efficient that upgrading and other component manipulation isn’t possible 1 2. 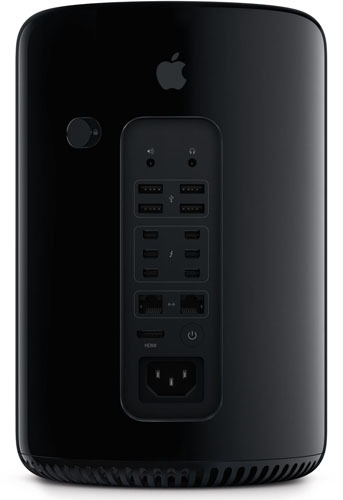 I’ve said it before, and I’ll say it again: It might look like a trash can, but the Mac Pro’s design is ingenious. It’s small, efficient, and convenient. Above, I pointed out that it costs more to upgrade to a given CPU on the Mac Pro than it does to purchase the same CPU outright from an etailer, but that was to highlight nothing other than the fact that to call the Mac Pro less expensive than a DIY build is nonsensical. Apple has to make money, after all, and it’s doing so in the same way other builders do – by charging a premium on components. For that price, you buy into that company’s designs, and in this case, Apple certainly delivers. By contrast, PC’s perks can’t be ignored. While the Mac Pro lacks in component flexibility1, the PC thrives on it. Sure, you’re going to wind up with a much larger build, but that’s a side-effect of it not being built from the ground up. You simply couldn’t purchase an off-the-shelf chassis that gives you anything close to what the Mac Pro gives you. Plus, consider this: Should a Mac Pro die after its warranty period, it’s likely to be thrown into the trash can – ironic, but true. On the PC side, parts can be salvaged – and, not to mention, PCs would allow the user to correct hardware issues, rather than require a visit to a store to get the deed done. As I’m sure is obvious, both the Mac Pro and the DIY PC offer unique benefits. In the end, it’s up to you to decide which suits you better. Tossing the idea of price comparisons out the window, both platforms are unique, offer their own sets of perks, and simply can’t be easily compared. 1 (Friday, December 27th update) Thanks to a teardown done by Other World Computing, we can see that the latest Mac Pro can be upgraded to some degree. For starters, the CPU socket is accessible, which means upgrading to a different LGA2011 Xeon processor should be possible. Likewise, Apple’s stuck to traditional DIMM slots here, so upgrading RAM shouldn’t be an issue either (assuming you can find appropriate ECC sticks). The GPUs sport a custom design, though, so in order for upgrades there, Apple would have to sell them itself. 2 (Tuesday, December 31st update) The lack of user-upgradability (and access in general) on this Mac Pro has proven to be quite untrue. In iFixit’s teardown, we get a fantastic glimpse at not only how easy it is to access the individual components, but replace them as well. As with the Other World Computing teardown mentioned above, iFixit confirms that the CPU and RAM could be user-replaceable (which would assume that Apple is not going to reject dissimilar hardware (eg: parts it doesn’t sell) in the EFI firmware). The GPU and SSD are replaceable as well, but due to their proprietary connectors, Apple would have to sell replacements / upgrades itself.